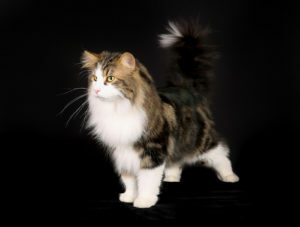 What is the Average Life Expectancy of a Norwegian Forest Cat? Norwegian Forest Cats, the beautiful and playful cats of Norway, are becoming a more popular breed around the world every year. Their kind, loving, and gentle personality combined with a distinctly beautiful appearance have made the Wegie a favorite among fanciers and families alike. While Norwegian Forest Cats can live for up to 14-16 years or more, their average expected lifespan is 10-12 years. 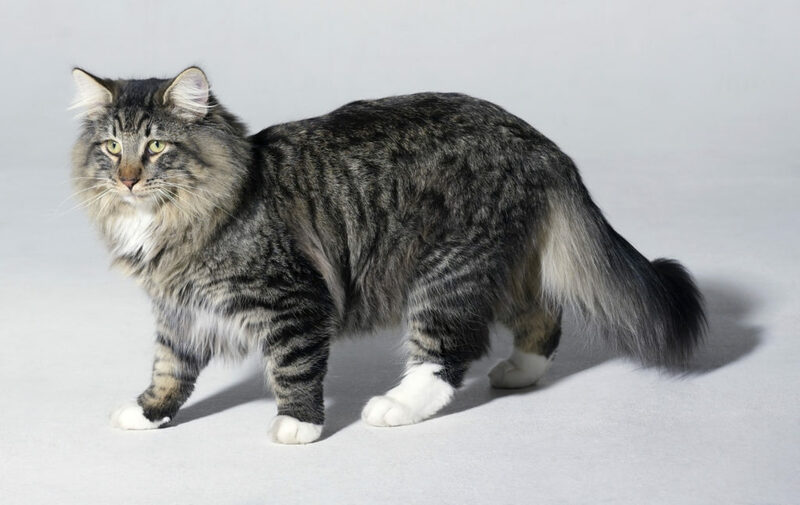 If you choose a Norwegian Forest Cat as your next pet, you should be aware of several common health issues that disproportionally affect Norwegian Forest Cats and can potentially shorten their lifespan. Always take your Wegie to the veterinarian for regular checkups, and make an appointment immediately if any of the following symptoms appear. Below is a short list of the most common health issues that you should keep an eye out for. Signs of this disease are usually shown around 5 months of age. These include fever, muscle tremors, weakness. In case these symptoms are present, a DNA test at the veterinarian can help to identify the cause. The signs of this specific heart disease can show up at any time between 3 months to 16 years, while it mostly affects male Wegies. Symptoms include a loss of appetite, difficulty breathing, collapsing, “snapping” breathing sounds, and exhaustion from any exercise. An EKG at the vet can help to identify this disease. There are several treatment options to treat this disease. This disease can be harder to identify, and is usually only recognized at a progressed state where infections can cause abdominal discomfort. If your Wegie has been diagnosed with this disease, it will need regular monitoring and treatment (which is sadly limited, as there is no known method to eliminate this disease). This eye defect can be easily identified, as it can cause several abnormalities in the eye or in the surrounding tissues. There are several possible treatments, depending on the condition of your pet. Being aware of these common issues and getting regular vet checkups can help to maximize your Wegie’s lifespan, which can last 16 years or more.